Investing in the best dividend stocks can be a powerful strategy to maximize your returns over the long term. The following chart shows historical returns for investors in the S&P 500 index over the long term from two different points of view. The traditional version of the index shows only capital gains, meaning price movements. 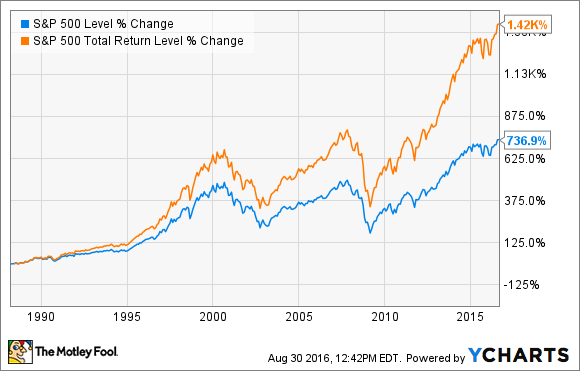 On the other hand, the S&P 500 Total Return Index includes both capital gains and dividends. The total return version basically assumes that all dividend payments from companies in the S&P 500 are reinvested in the index, and this can have a huge impact on performance over the years. If a picture is worth a thousand words, the chart is speaking volumes. Dividends can be a major return driver in the long term, and investors would be wise to pay close attention to cash distributions when looking for the best opportunities in the market. Dividends are not only a big component of total returns -- cash distributions are far more stable and predictable than capital gains. Stock prices fluctuate for a variety of reasons, not only related to the specific company's fundamentals, but also to general market conditions and investor sentiment. This means that price fluctuations are practically impossible to predict with certainty, especially in the short term. Dividends are very different. Many companies are deeply committed to maintaining and increasing their dividends over the years, so management won't cut dividend payments unless it really needs to do so because of financial constraints or some other really important consideration. When investing in solid dividend stocks with sustainable cash distributions, regular dividend payments provide stability and predictability to returns. When it comes to price returns, you need to sell your stocks to transform your gains into cash. This can be problematic when you don't think it's a good time to be selling in the market due to temporarily depressed prices. Dividends, on the other hand, are paid in cold, hard cash regularly deposited in your brokerage account. This can be a huge advantage for investors, especially for those who need recurrent income from their portfolios, such as retirees. Additionally, dividends say a lot about the fundamental health of a company, and this is one of the main reasons why dividend stocks tend to do so well over time. If a company aims to sustain dividend growth over the years and decades, then the business needs to be strong enough to generate consistently growing cash flows under all kinds of conditions. PepsiCo (NASDAQ:PEP) is a great example to illustrate the point. The company is a global leader in the nonalcoholic drinks and snacks industry, and it owns an enormously valuable portfolio featuring 22 different brands making over $1 billion each in annual sales around the world. Brand recognition, scale advantages, a gargantuan distribution network, and abundant financial resources provide additional sources of strength for this consumer juggernaut. On the back of this remarkably strong business model, PepsiCo has built an impressive track record of dividend payments. The company has paid uninterrupted dividends since 1965, and it has increased payments in the last 44 consecutive years. 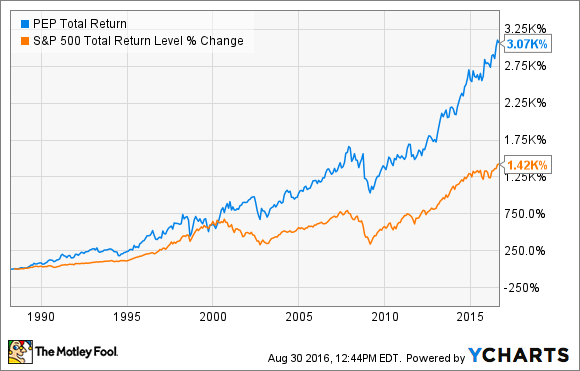 On a total return basis, PepsiCo stock has downright crushed the S&P 500 index over the long term. PEP Total Return Price data by YCharts. There are different approaches to dividend investing, and it's important to understand what different kinds of dividend stocks have to offer. The trade-off between dividend yield and dividend growth is a major factor to keep in mind in this area. AT&T (NYSE:T) is a top player in the telecom sector, and the business generates strong cash flows. However, the industry is facing major challenges due to new technologies reducing communication costs across the board, and it's quite difficult for AT&T to find organic growth opportunities. The stock pays a compelling dividend yield of 4.7% at current prices, but AT&T has raised dividends by only $0.01 per year since 2009. In percentage terms, this means a dividend hike of just 2% for 2016. According to financial data for the second quarter, dividends absorbed nearly 73% of free cash flow year to date. That ratio is fairly sustainable, but it doesn't offer much upside room. Since revenue and cash flow growth will probably remain subdued in the coming years, this means that dividend increases will likely be quite modest, too. In a nutshell, AT&T is an attractive pick for investors hunting for dividend yield, but it doesn't offer much in terms of dividend growth. Nike (NYSE:NKE), on the other hand, offers an unimpressive dividend yield of only 1.1%. This is substantially lower than the average dividend yield for companies in the S&P 500 index (around 2.3%). However, the company doesn't leave much to be desired in terms of dividend growth: Nike has more than doubled dividend payments in the last five years, including a 14% dividend hike for 2016. Nike distributes nearly 51% of its free cash flow as dividends, and the business is growing at a healthy rate. Constant currency sales increased 12% in fiscal year 2016, while earnings per share jumped 17% year over year. As long as the business continues on the right track, everything indicates that investors in Nike stock will be rewarded with vigorous dividend increases going forward. Focusing on dividend stocks can be a great strategy to maximize your returns over the long term. Depending on your specific needs and risk tolerance, you may want to consider stable and mature companies with big dividend yields like AT&T, or younger businesses with attractive potential for dividend growth such as Nike.